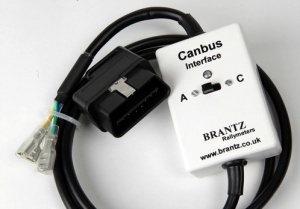 The Brantz CANBUS Interface can be plugged directly into the vehicles CANBUS System via the OBDII socket to obtain both power and the speed/distance information to be fed directly to the tripmeter. Idea for modern hire cars or a race recce in your own modern car. Compatible Vehicle List shown separately or contact Brantz for more details.